Multiple site deliveries, restricted time frames and atrocious weather conditions all added to the challenge of contributing to a barge/ballast project for the oil industry conducted by Osprey Shipping. Part of their operation involved the beaching of a large sea going barge at Wester, Wick, in Scotland, to be used as a temporary pier for other barges. To de-ballast the barge, a total of twenty-four 6” diesel pumps, together with associated pipes were supplied by SLD, who worked closely with on-site client teams. The HL125 pumps transferred water from a nearby river some 900m, via 2 x 6” pipe lines, to the barge, and were then coupled up to SLD’s pre-assembled pipework, c/w ”T” pieces, and butterfly valves on board the barge. 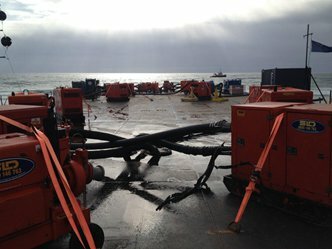 “In total, four such ballasting procedures were required on the Subsea 7 contract, with hire times ranging from between one to three weeks and requiring about twenty-four 6”pumps+hoses per barge,” explained SLD Pumps sales manager Phil McDevitt. “Out of the ordinary seems to be the new normal for SLD”, remarked the local SLD Pumps depot manager Uisdean Ferguson, when the job was successfully completed.